Start. 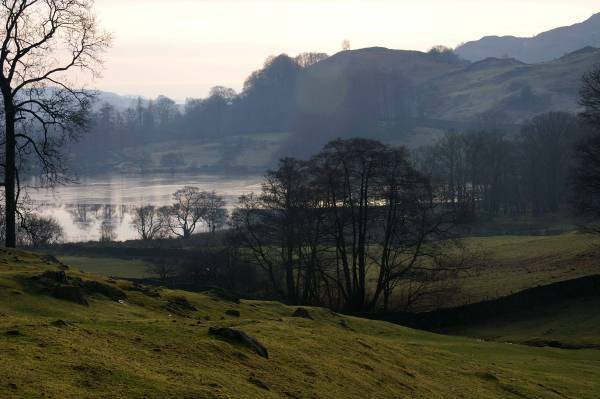 Ambleside (Under Loughrigg Lane). Route. 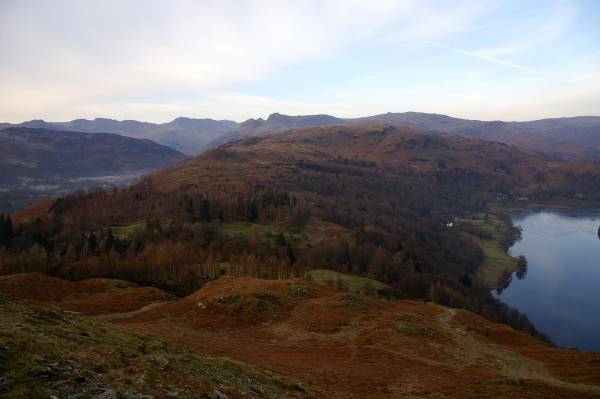 Ambleside (Under Loughrigg Lane) - Miller Brow - Todd Crag - Lily Tarn - Black Mire - Loughrogg Fell - Loughrigg Terrace - Red Bank - Loughrigg Tarn - Ivy Crag - Miller Brow - Ambleside (Under Loughrigg Lane). Notes. 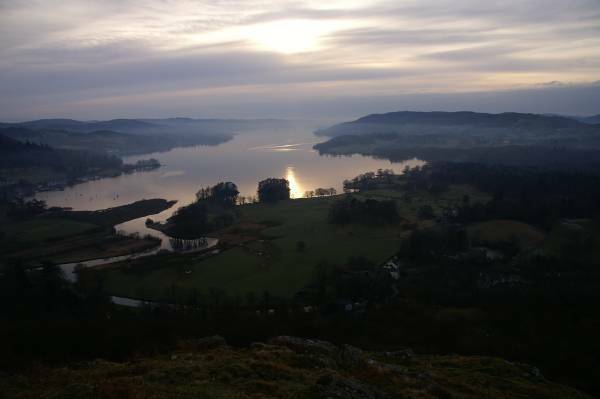 A short drive today, I've decided to summit Loughrigg Fell from Ambleside, a figure of eight allowing me to soak up views from Todd Crag, Loughrigg summit and also visit Loughrigg Tarn. I left the car on Under Loughrigg Lane near the footbridge into Rothay Park, I crossed the cattle grid before turning left on a bridleway that lead to Elterwater, at High Barn a fingerpost directed me over a stile to Clappersgate, I followed this path until reaching a wooden footbridge, here my ascent to a small row of unnamed crags above the head of Windermere begun, I've always known this row of crags as Todd Crag but Todd Crag is actually a third of a mile to the north west, never mind they've got better views. From here my route took me north west passing Lily Tarn and Todd Crag before crossing the bridleway I'd left earlier, an easy scramble above Black Mire then the summit of Loughrigg Fell with it's stunning views over Grasmere. The steep descent to Loughrigg Terrace followed from where I made my way to Red Bank Road, now with tarmac under foot I was on my way to Loughrigg Tarn, Loughrigg Tarn may be a lot lower than Loughrigg Fell but It gifts you with some of the best views to be had of the Langdale Pikes. After crossing two fields I join a bridleway, yes it's the one that's been haunting me all morning, this time there's no escape, I follow it all the way back to the car. 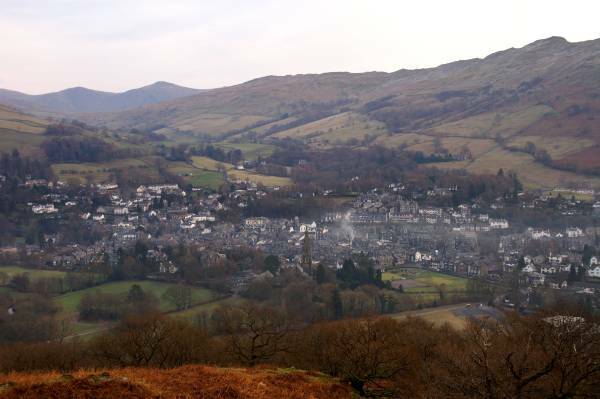 Above the valley of the River Rothay with views across Ambleside. 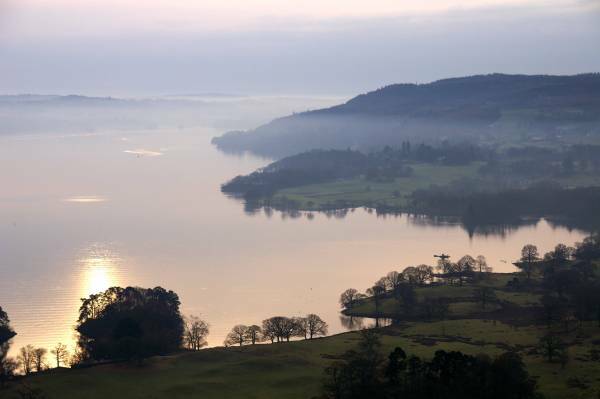 Winter sun reflects on the waters of Windermere Lake. 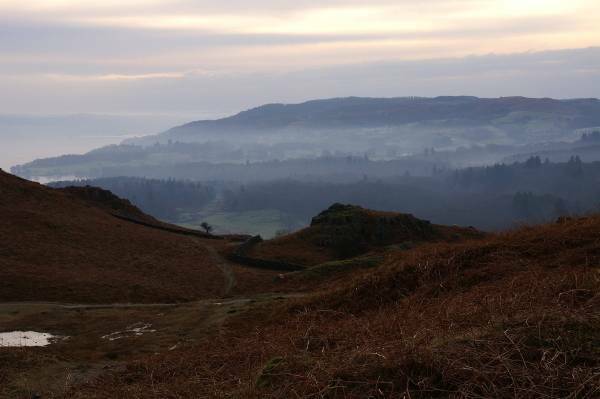 Views across Loughrigg Fell, on the far horizon the Langdale skyline. 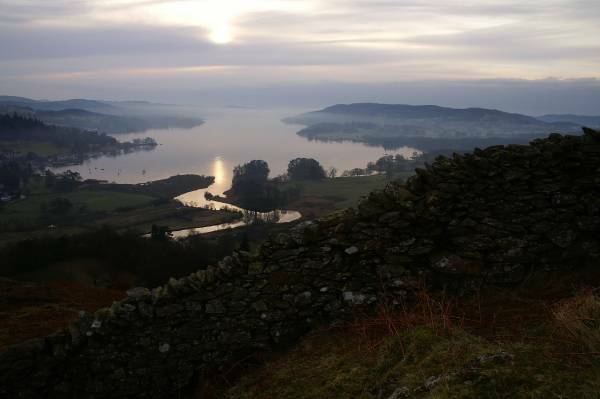 There are wonderful views to be had from this row of low cliffs above the head of Windermere. To the north the Langdale Valley. Winding it's way south the shimmering waters of Windermere Lake. 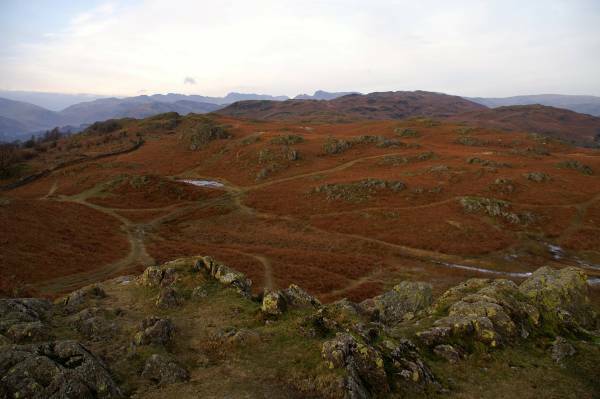 Wetherlam backed by Great Carrs seen across Langdale. 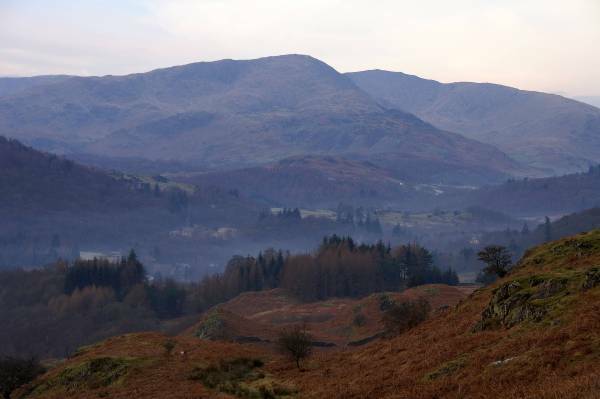 Seen over misty lowlands Claife Heights, the small rocky knoll in the foreground being Todd Crag. 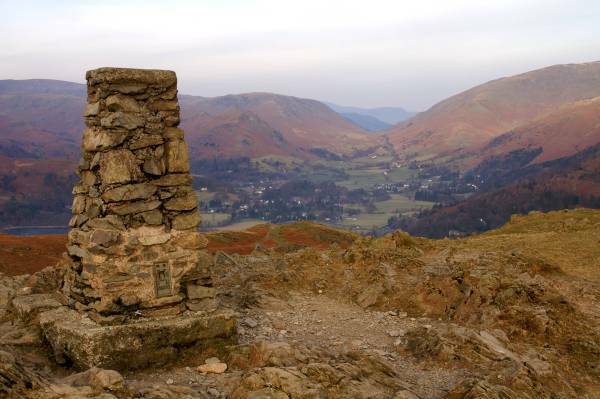 Between the slopes of Steel Fell and Seat Sandal the pass of Dunmail Raise as seen from the summit of Loughrigg Fell. 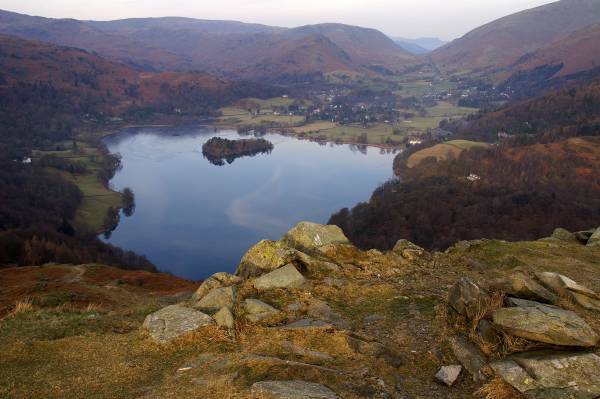 Another wonderful Lakeland view, Grasmere seen from the aggressively steep slopes of Loughrigg. 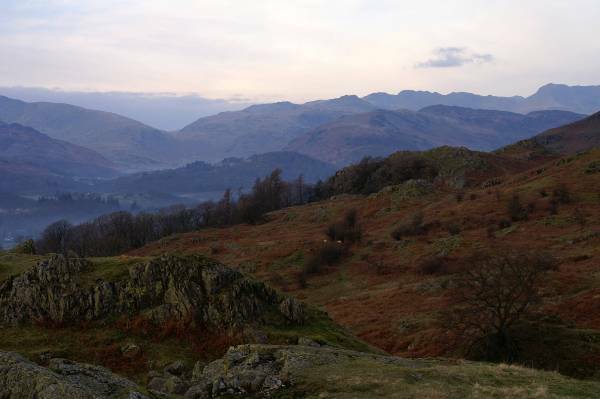 The familiar silhouette of the Langdale Pikes seen over one of Lakeland's lesser heights, Silver How. 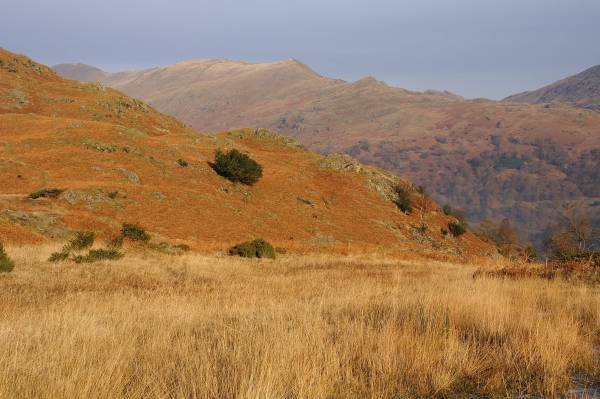 Descending Red Bank Road with views to Wetherlam. 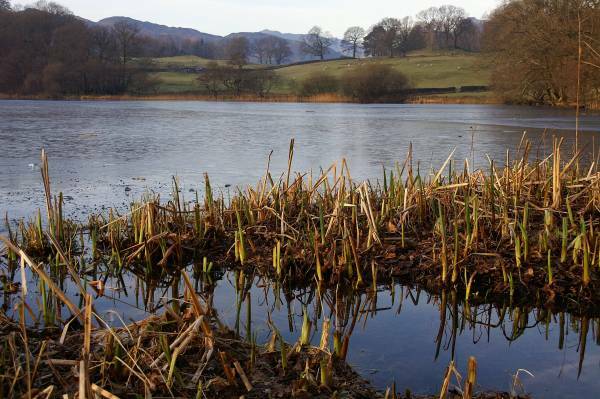 Little Loughrigg seen over the icy waters of Loughrigg Tarn. 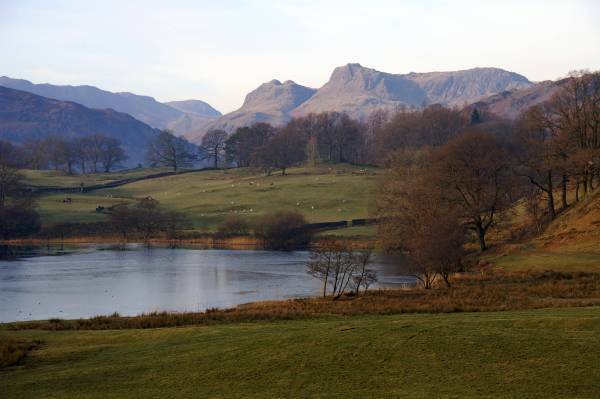 Wainwright's crouching lions, the Langdale Pikes. 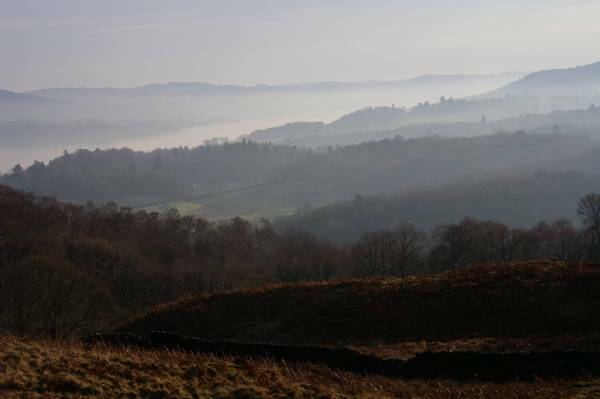 Shining levels, morning mist still hangs over Windermere, seen from under the cliffs of Ivy Crag. 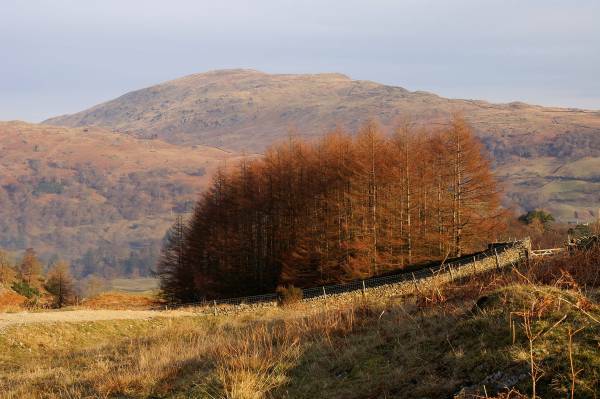 As I cross Loughrigg Fell the sun finally makes an appearance, looking to High Pike. 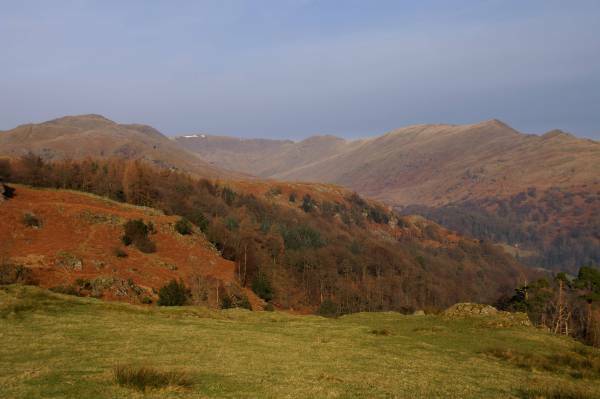 Above the trees the Scandale face of Red Screes. 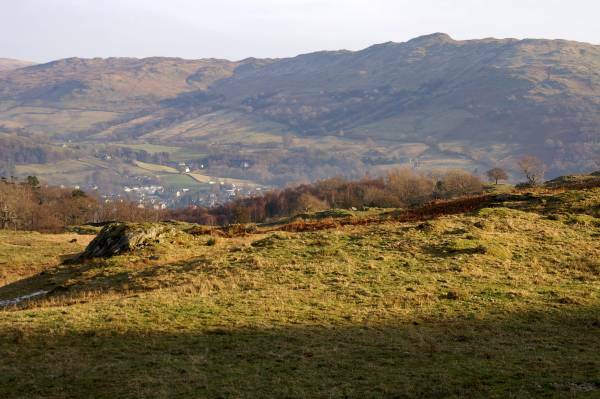 The stunning view to Wansfell Pike above Ambleside. 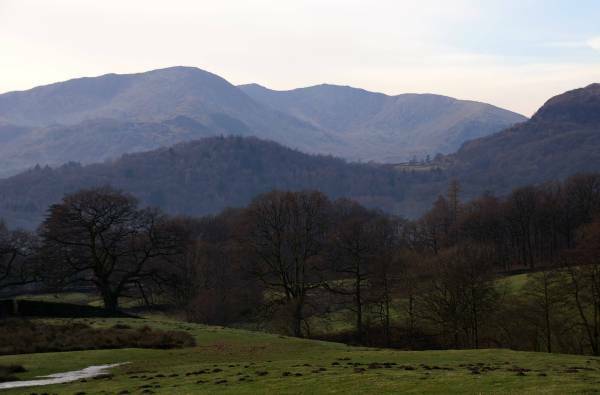 Before making my descent a final view, the Fairfield Horseshoe.